Halcombe Norilsk: Love declaration to Brian Griffin!!! 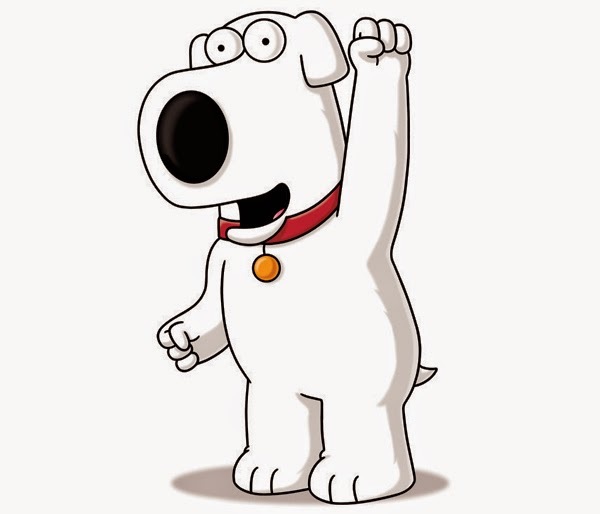 Brian Griffin from Family Guy is my favorite Television Character, it is funny to think that a dog is so witty, clever, imaginative and even a womaniser that is crazy about beautiful girls without any kind of luck, as a result, he ends up drinking too much alcohol. His relationship`with a little boy named Stewie Griffin is anything but peculiar, they are supposed to be inferior, yet they are much clever than any other character from the aforementioned television series. Stewie Griffin and Brian Griffin are so special that its friendship is something so remarkable that one only can see that television series because of these two characters. For instance, Stewie Griffin is sadistic, hates his mum, wants to conquer the world and has an incredible IQ albeit he is only some months old. Even though Family Guy is lasting too much hence its jokes no longer are funny because if you compare them to previous chapters of Family Guy you have the feeling something has seen before I really think Brian Griffin is and will be one of the funniest television characters ever. Do you like Family Guy? Do you like Brian Griffin? Do share, rate and comment.